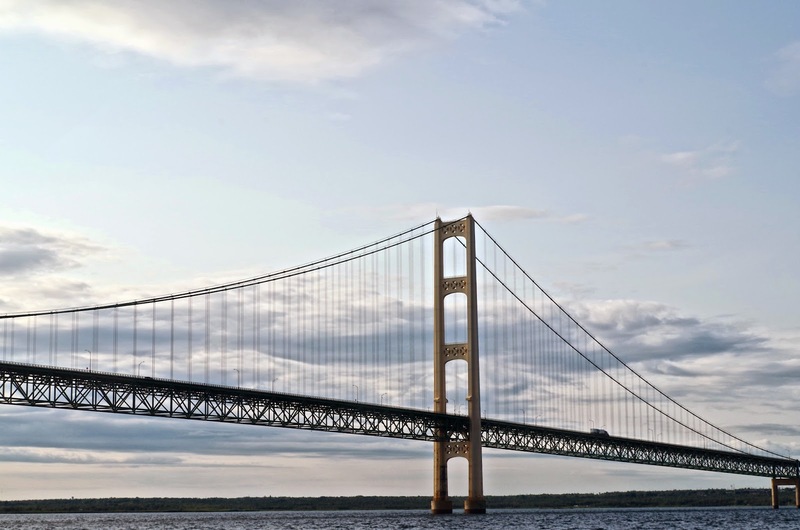 Champagne Wishes and RV Dreams: The Upper Peninsula! 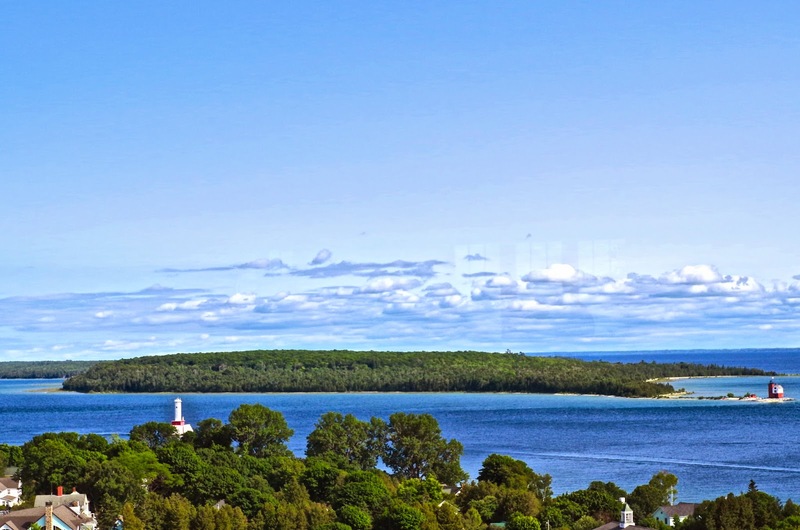 Anyway, as I was saying, we finally made it to the U P, the area I've most looked forward to - the home of Mackinac Island, Sault Ste Marie & Lake Superior! 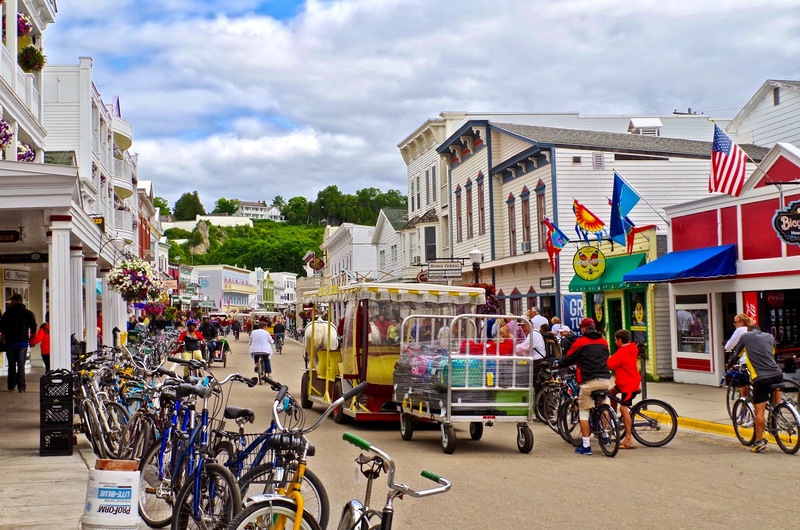 Once settled, our first mission was to take the ferry over to Mackinac Island. We caught a clear, sunny day out of a week of cold on & off rainy ones and took an early ferry over. If you don't know, they have an interesting history there, in that back in 1948 the carriagemen continued the ban of autos (since 1869) on the note that they "startled the horses and caused harm to the people". Thus, the only way around the 3.8 sq mile island is by carriage, foot, horse or bicycle! They do allow snowmobiles in the winter tho (of course nothing public is open then, but hey, if your local, go for it!). We opted for the carriage tour! A great way to see the island, hear about the various spots and get on and off to visit at length at the Fort. 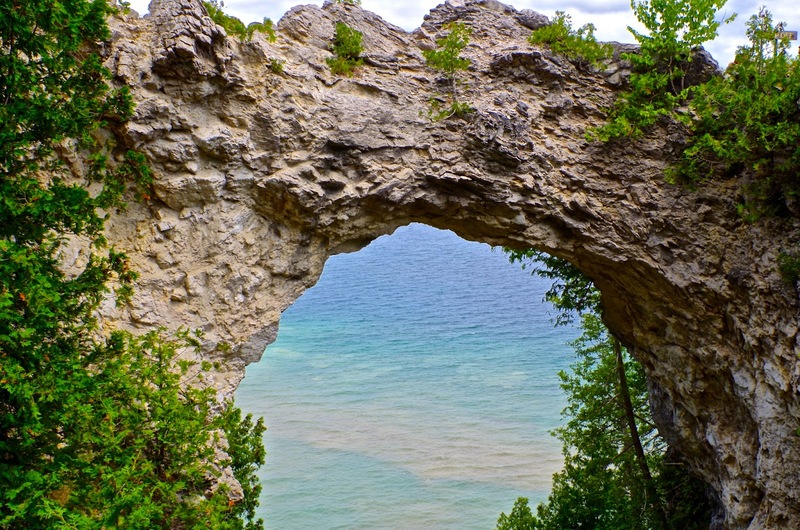 They give you a brief stop at Arch Rock where you can get out and take a couple of pictures, then hop back in to tour the State Park. The State Park actually encompasses 80% of the island, and is lush and feels so far away from the little town. It also houses the three cemeteries on the island, Protestant, Catholic and one for the Fort (they don't believe in co-mingling there). 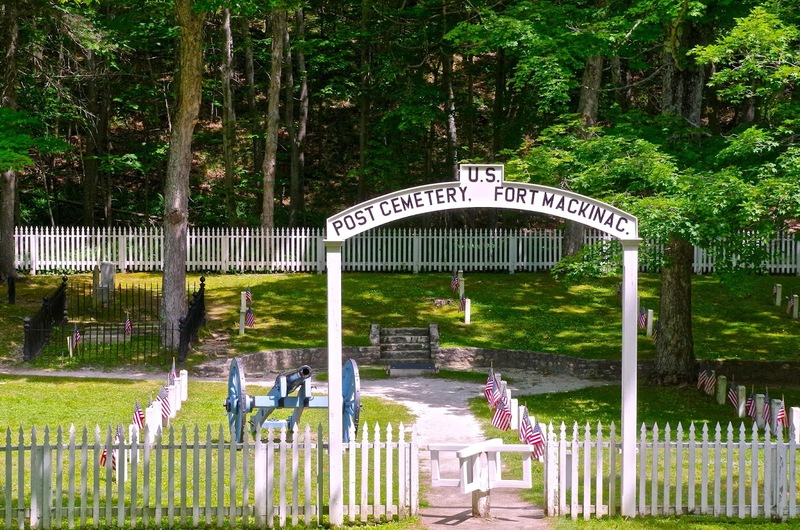 Fort Mackinac is a restored 18th & 19th century British & American military outpost preserved as a museum. 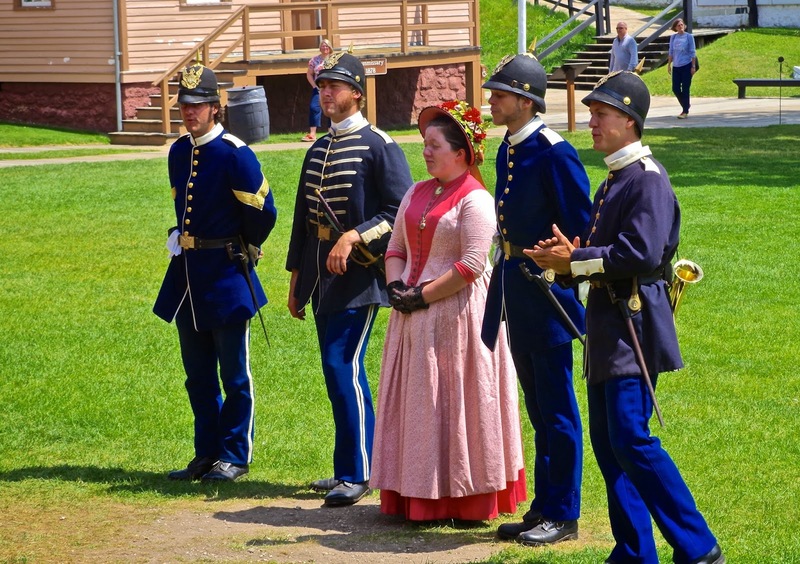 All the buildings are original; their history is interpreted through period settings and you are greeted with period costumed folks and throughout the day, reenactments of cannon firings, musket firings, music & dance are done. It was quite nice. From there we took a nice walk back into town and visited the Biddle House that was connected to the Benjamin Blacksmith Shop. 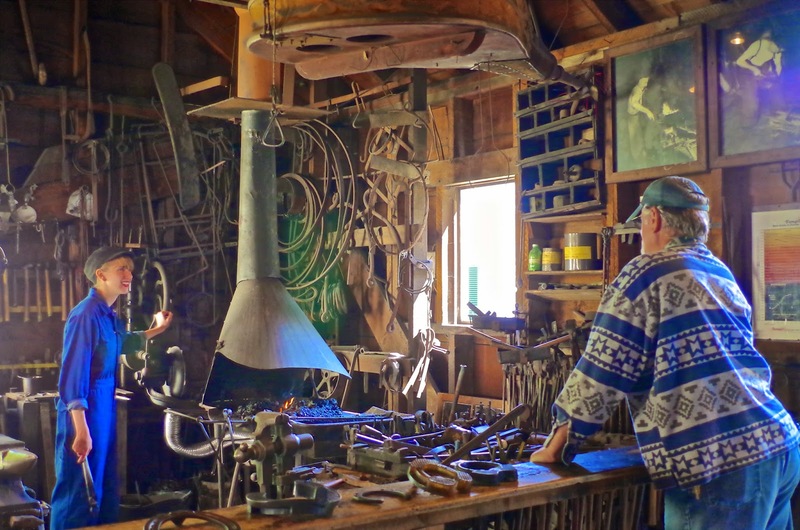 A young woman was at the forge (and doing quite well!). Jack enjoyed conversing with her and seeing their set up, which was very impressive. It was a large shop using original 19th & 20th century equipment, giving people nice demonstrations. Time for lunch! 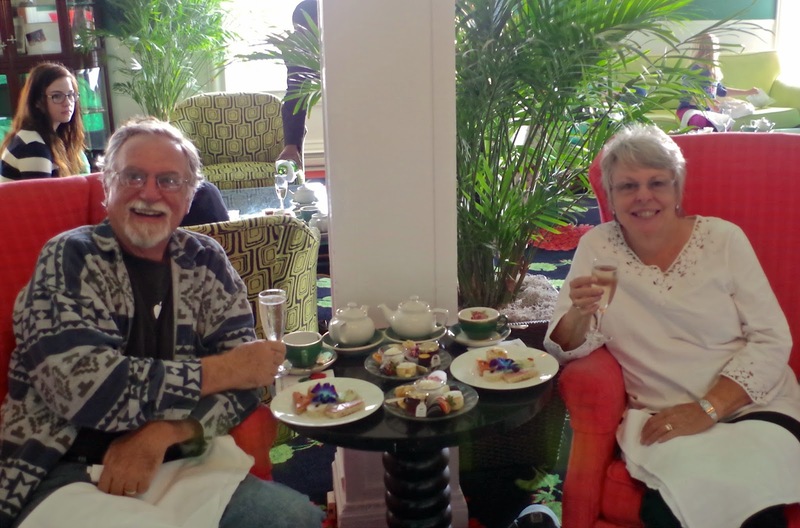 We decided to really treat ourselves and have "high tea" at the Grand Hotel. 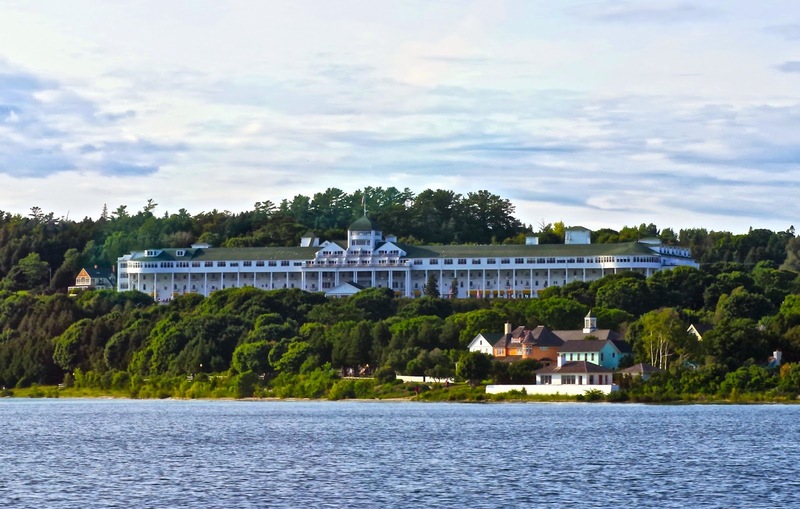 This is the hotel where the 1980 film Somewhere in Time was filmed with Christopher Reeve. Such a beautiful place, we couldn't resist! You actually have to pay to even go into the hotel, but who cares, right? 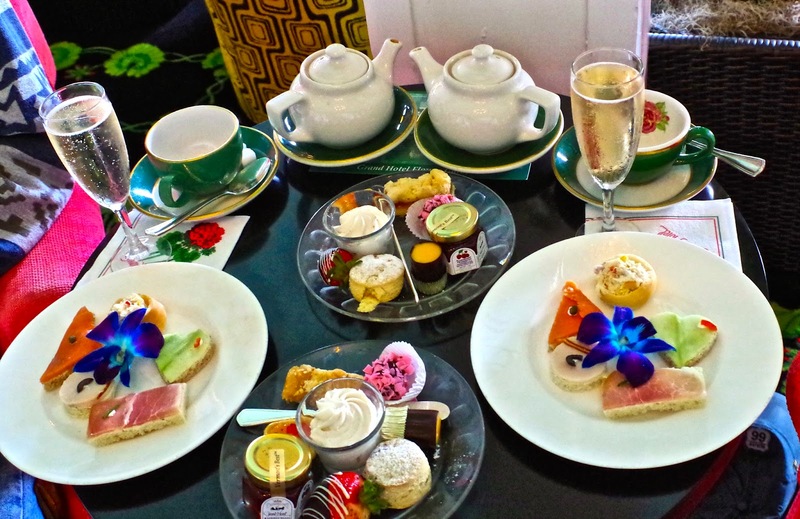 They do it in style, a lovely lady playing the harp, butlers in tails, champagne, sherry, fancy canapes with a orchid on the plate, deserts to die for, ah, heaven! Oh, and of course, the endless view of Lake Superior and the two lighthouses, what could be better? All in all, a lovely day...well worth the wait! We never did try any of the 17 different fudges...oh well, guess we will just have to come back again another year! 'Eh? We can hardly believe it's now year seven for Jack and I, in our quest to "see the USA" in our 36' Tiffin Allegro Motorhome. It all started in January, 2012, after retiring from the printing industry (Jack) and the San Diego Zoo (Marie). 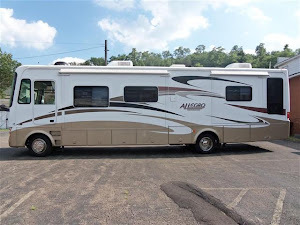 We sold our Escondido (California) home, put our remaining treasures in storage, bought the motorhome of our dreams (a 2008 little used beauty) and set out to see all that we could see! Our only goal was to "follow the sun" as neither one of us are big fans of cold weather, especially driving in snow. Our first destination was to head slightly east towards friends. 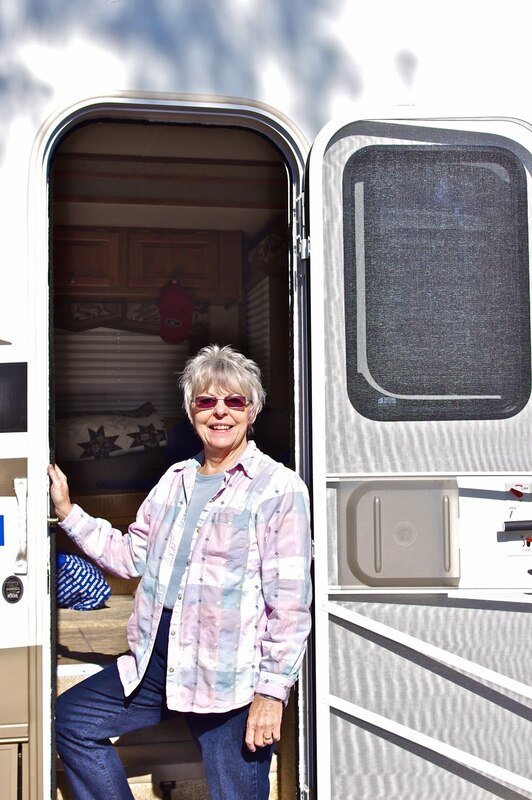 Several years ago we had a number of our friends who had abandoned the work-a-day-world in favor of a full-time RV life, two couples that had done that, now were living in Nevada, & Arizona and we wanted not only to see them, but to learn as much as we could from them! With little more than their wonderful sage advise, we soon set off for the adventure of our life. We loved every moment of it; so much so, we are now going forth with year seven! If you followed along with us during our first years, welcome to year seven, and thanks, as it's nice to have company (be sure to say "hi" sometimes)! If you are new to the blog, "welcome" and I hope you enjoy the trip. You would think that after all these years, we'd "seen it all"...but no, we haven't! This is a beautiful country and we never get tired of discovering it. Every back road leads to a new and wonderful adventure! We finally have "crossed off" all the lower 48 states, but that doesn't mean there are no surprises left, no new campsites to explore, no new parks to visit and favorite spots to see once again! We changed our "status" this year, in that we went from "being on the road full-time" to "being on the road part-time"...but the adventure is still the same! Come along with us and see! Further adventures in the U P!